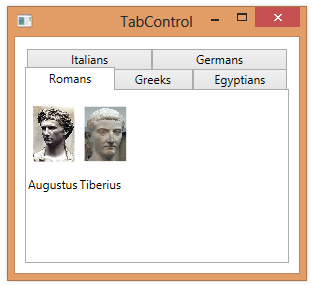 When you define a series of TabItems for a TabControl, the tabs will be displayed across the top of the control, next to each other. 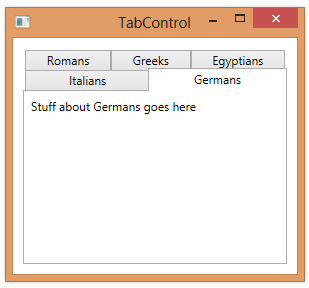 If you have more tabs than will fit across the top of the TabControl, the tabs will automatically be wrapped to a second row. The width of each tab will then be adjusted so that the total width of the tabs is spread across the control. 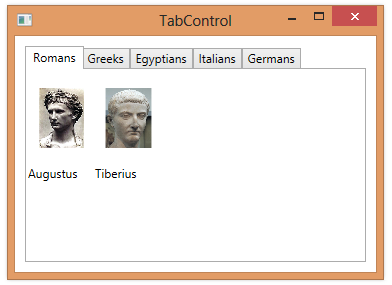 Tabs will also flow to multiple rows if you resize the TabControl so that the tabs no longer fit. If we make the window shown above wider, the tabs will be moved back onto a single row. Note that when you have more than one row, clicking on a tab makes that tab’s row the bottom row.